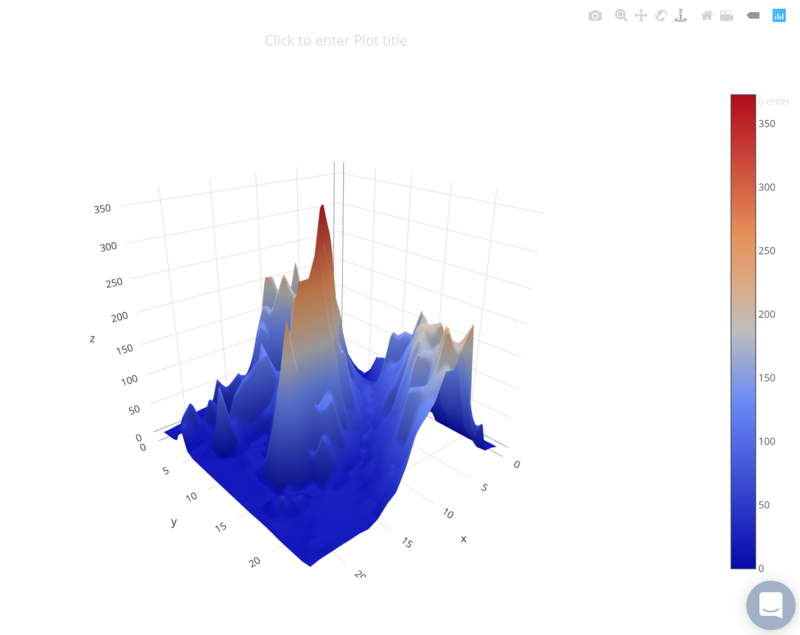 Create a three-dimensional surface plot that connects a set of data points. 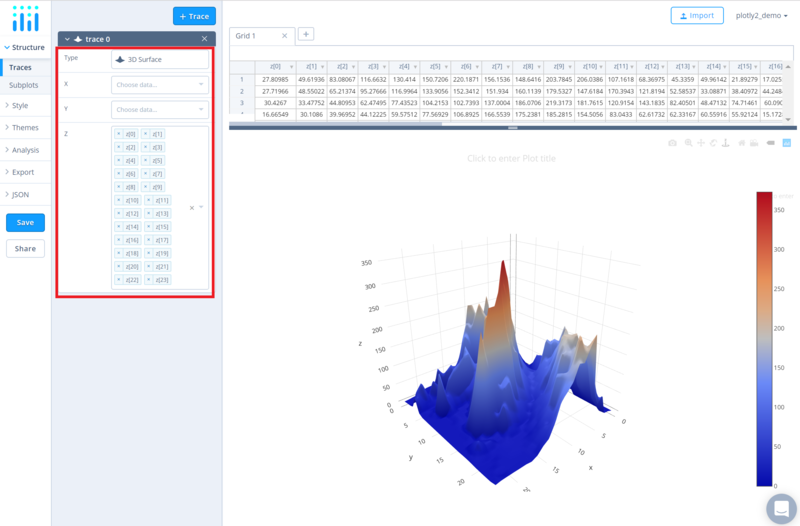 After adding the data, go to the 'Traces' section under the 'Structure' menu on the left-hand side. 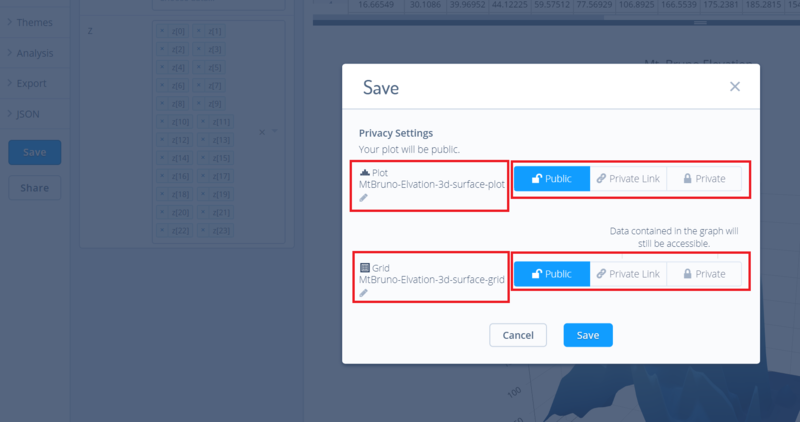 Choose the 'Type' of trace, then choose '3D Surface' under '3D' chart type. Next, fill out the necessary 'X', 'Y' and 'Z' values from their respective dropdown menus. This will create a 3D surface, as seen below. In this example, our data was formatted as a Z matrix so we will add all columns of our dataset to the 'Z' dropdown. 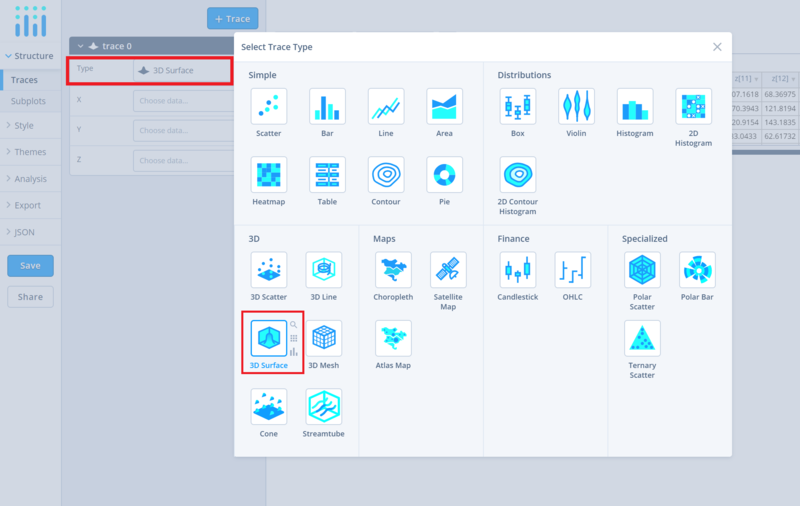 We do not have to specify 'X' or 'Y' data in this example, so we will leave those dropdown fields empty. 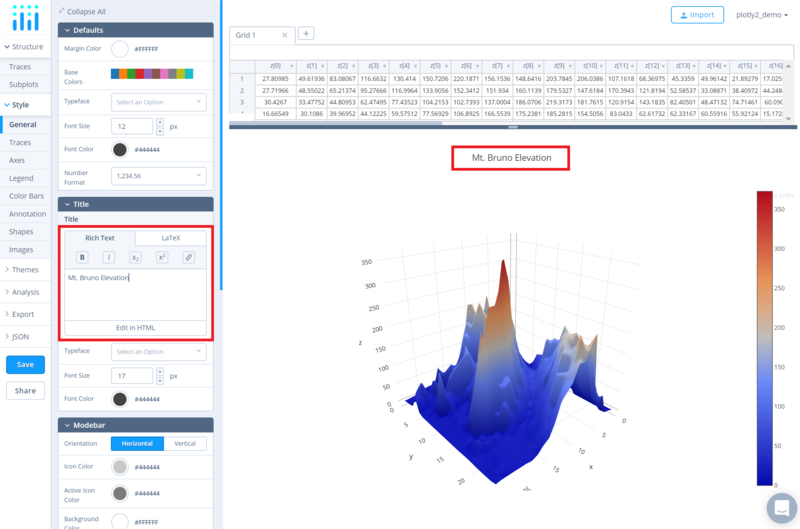 Use the 'Traces' section under the 'Style' menu to change the properties of the 3D surface such as the colorscale, lighting effects, light position, and hoverinfo. 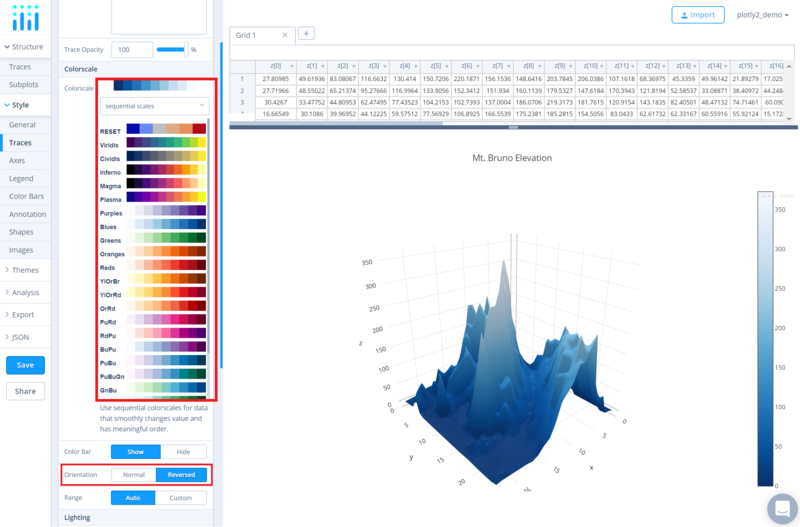 To change the colorscale of the traces, click on the current colorscale next to the attribute 'Colorscale,' which will display a dropdown menu with the available colorscale types and their corresponding preset colorscales. Choose the desired colorscale. To reverse the chosen colorscale, set the 'Orientation' attribute to 'Reversed', as seen below. Additionally, to show/hide the color bar, set the desired option next to the attribute 'Color Bar'. Use the 'Color Bar' section under the 'Style' menu to change the size and positioning of the color bar. 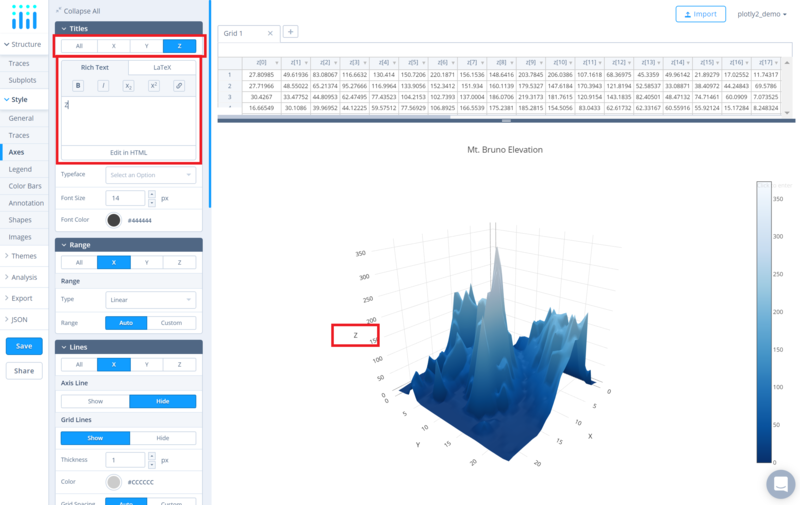 To change the axes tile, go to the 'Axes' section under the 'Style' menu and type the title text within the textbox provided under the 'Title' property for each axis.